We’ve all seen those videos of people using black peeling face masks to remove blackheads, which are both gross and satisfying to watch. I’ve always suffered from blackheads on my nose since I was a teenager, thankfully they aren’t overly noticeable with makeup on. The only thing that removes them is the Biore Pore Strips, however, you don’t get many in a pack. I was tempted to buy the black face masks that people have been using from eBay but some look painful to remove and there have been reports of them damaging the skin and containing glue. While in America, I noticed Boscia had their own equivalent called the Luminizing Black Peel Off Mask. I figured this would be better regularised than products from eBay. I haven’t tried the eBay black masks but I imagine they work very similarly to the Boscia Luminizing Black Mask. All you need to do is apply a thin but opaque layer of the gloopy product and wait until it’s completely dry before peeling off. It took around 15 minutes for mine to dry, although the packet suggests it might be more like 25 minutes. It is important that you completely avoid the eye area with this product as it is much more delicate than the other skin on your face. When it came to peeling it off, I had to use my nails to grab the edges and slowly peel it off starting at my chin and working around the sides of my face. It does slightly pull at the skin but nothing that is overly painful. Okay, now to the gross bit, when I pulled the black mask off my nose area, I inspected it (don’t tell me you wouldn’t too), to see if there were any blackheads on the surface – nothing! I am used to seeing a few when I peel off the Biore Pore Strips, so this was a little disappointing. I did think my skin looked slightly clearer after removing the mask, I put this down to the charcoal ingredients, however, I wouldn’t say my skin was ‘luminized’ afterwards. 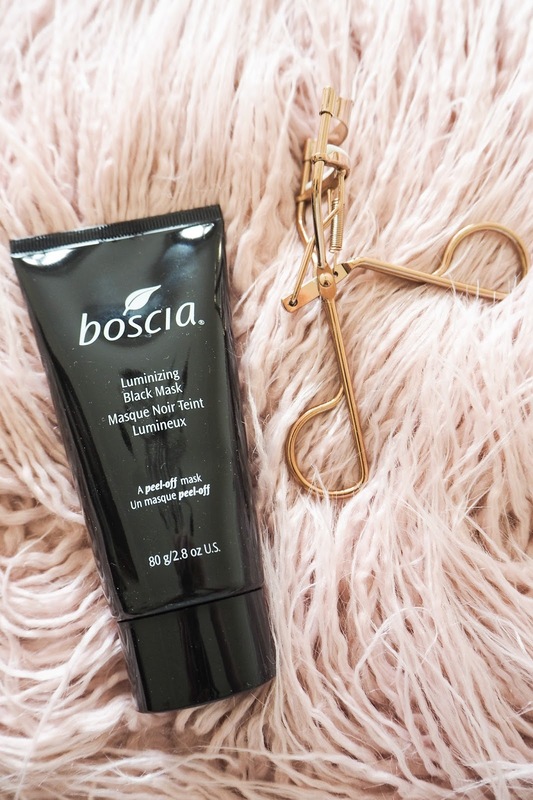 The Boscia Luminizing Peel Off Black Mask seems like a bit of a novelty to me, I would much rather use my Origins Clear Improvement Mask teamed with the Biore Pore Strips for a gross but satisfying clear out on my skin. I've been curious about trying those black peel-off masks recently, too. I was worried about trying any from brands I'd never heard of, though, just in case they caused a bad reaction and left my skin red raw! It's good that this one wasn't painful to remove, but it's disappointing that it didn't really do much in terms of unclogging pores. I think I'll stick with my usual clay masks, too! Yes, I was a little worried about the ones I'd seen online but this isn't bad! A UK beauty, fashion and lifestyle blog. All content is copyright © 2012-2018 Cherries in the Snow. All rights reserved, please do not use, take, copy or republish images or content without written permission.